Life in My City Art Festival – more often known by its acronym LIMCAF – should be high on the list of the most credible visual arts events of recent memory. As Nigeria’s longest-running art festival – it is now on its 12th edition – the annual event metaphorically opens the cultural gateway to Enugu. Hence, in the course of its arduous progression to reckoning, it has drawn aficionados from across the country and beyond to the serene south-eastern city. Indeed, the festival, whose resilience is now legendary, has remained unrivalled as the only surviving youth-focused art festival in the country. This is one good reason why it deserves the generous support of the corporate world. Because the annual festival has elicited and sustained the interest of FBN Holdings and the Enugu State Government, among others, it has this year also courted the interest of the telecommunications company MTN. That then explains the presence of the MTN Foundation Director Dennis Okoro, who was in the good company of the event’s special guest of honour and one of Africa’s most renowned collectors, Omooba Yemisi Adedoyin Shyllon. Of course, there was the Enugu State Governor Ifeanyi Ugwuanyi, who has since last year’s edition always personally attended the awards and gala night held at the Institute of Management and Technology, Enugu’s International Conference Centre. Also, the Obi of Onitsha, Igwe Nnaemeka Achebe has consistently graced the annual event with his royal presence. Specifically, this year’s edition also had the singular honour of hosting, among other dignitaries, the Regional Manager of First Bank, Nnamdi Amala, who represented U.K. Eke, and the Chairman of the Enugu State Traditional Rulers’ Council, Igwe Lawrence Agubuzo. Last year, its high-profile attendees included the former Cross River State Governor, Donald Duke, Nigeria’s former high commissioner to the UK, Christopher Kolade and his wife as well as a representative of the French Embassy, among others. LIMCAF’s struggles from modest beginnings to grace leave many in the local art community in awe. From being bankrolled during its first four years by Chief Robert Orji’s advertising and printing firm Rocana Nigeria Limited – and its first toddling steps watched by the Alliance Française Network and the French Embassy – the festival has come of age and assumed enough importance to be noticed by such visual arts greats as Bruce Onobrakpeya (who narrowly missed attending the 12th edition), El Anatsui, Obiora Udechukwu, Okwui Enwezor, Olabisi Silva and Kolade Oshinowo. It also elicited the interest of the likes of Jerry Buhari, Kunle Filani, Sani Mu’azu, Peju Layiwola, Joe Musa, Chijioke Onuora and Tonie Okpe along the line. Also, with his generous sponsorship of the festival’s last year’s top four winners – and his promise of sponsoring this year’s top six winners – to the Dakar Art Biennale, El Anatsui seems intent helping make the event one of the continent’s elite art events. Nothing prepared those who attended its modest official launch at the Enugu Press Centre in 2007 for what LIMCAF has become today. True, the invaluable input of Krydz Ikwuemesi and Ayo Adewunmi, who were members of the Pan African Circle of Artists – more popularly know by its acronym PACA – helped the festival. Ditto the efforts of two Rocana staff members, Esona Onuoha and Onyinye Igbo. Nonetheless, the endeavour would have fallen on the wayside in this creativity-stifling environment. At the festival’s Awards and Gala Night, held on Saturday, October 27, the LIMCAF 2018 overall winner prize worth N500,000 was awarded to Ifedilichukwu Chibuike for his work “Enigma”. Its eventual selection alongside other works, which were displayed at the Institute of Management and Technology, Enugu’s International Conference Centre, followed what the competition’s head juror, Professor Frank Ugiomoh, called “a reasonable and objective exercise”. At the event, the University of Port Harcourt-based art historian told the audience that the jurors had “adopted the subjective/cooperative mode of selection” for the winning entries under the guiding theme, Twilight. After the elimination of 12 winners of consolation prizes (worth N20, 000 each), other winners were rewarded with various prizes. First, there were the winners of the category prizes (worth N250,000) – Nurudeen Popoola’s “Ireti” (Expectation) for the Best Painting/ Mixed Media, Sale Godday Okwosi’s “Recycle” for the Best Sculpture/Installation/Ceramics and Taofeek Badru for the Best Textile Art. Then, there were the winners of the specially-endowed prizes like the N100,000 Justice Aniagolu Prize for Originality (won by Okewu Jonathan for his “Dancing in Bullets and in Brokenness”), the N150,000 Dr. Pius Okigbo Prize for Technical Proficiency (won by David Olatoye Babatunde for his “Ise Aro”), the N100,000 Lawrence Agada Prize for Most Promising Young Artist (won by Edward Samuel for his “The Gaze”) and the N50,000 Online-Viewers Choice Award (won by Moses Oyeleye for his “Abused”). 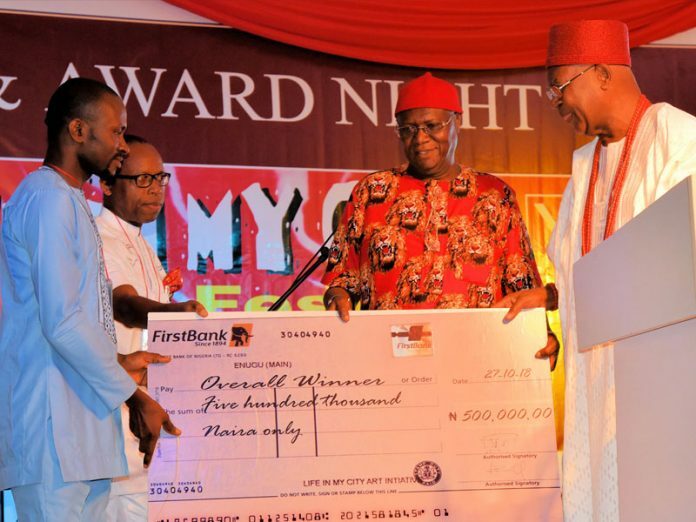 There were also the Alliance Française Network Prize (won by Taofeek Badru for his “16:59”), the N150,000 Mfon Usoro Prize for Outstanding Work from Uyo (won by Usoro Otobong for his “Twilight of Morality”), the N100,000 Thought Pyramid Prize for Outstanding Prize from Abuja Zone (won by Adeshina Adeolu for his “Focus”), the N100,000 Thought Pyramid Prize for Outstanding Prize from Auchi Benin Zone (won by Taiwo Sola Owoyemi for his “Make Hay Before Twilight”), the N100,000 Outstanding Young Lady Prize (won by Judith Dyeme Daduut for her “Dead Weight”), the N50,000 Vin Matin Ilo Prize for Outstanding Work from Enugu (won by Ejiofor Samson Maduabuchi for his “The Sound of Ikoro”) and Rele Gallery Award (won by Okewu Jonathan for his “Dancing in Bullets and in Brokenness”). Earlier in the week, before the awards and gala night, LIMCAF had organised a workshop for 100 school children. This was part of its pilot test for a proposed “annual mural project” aimed at beautifying public spaces within the Enugu metropolis. There was also a Photo Africa Workshop, sponsored by Tachi Studio, which featured 15 burgeoning photographers, who embarked on 24-hour photo study of Enugu (under the theme “A Day in Enugu”). “Selected prints from this workshop were exhibited at the grand finale exhibition, while a publication from the experience is under production,” said LIMCAF’s artistic director Ayo Adewunmi. In addition, an off-exhibition organised by the state’s chapter of the Society of Nigerian Artists held at the National Gallery of Art’s premises in Enugu. Meanwhile, the theme selected for the competition’s next year’s edition is The Other Side.